Impending Uprooting on San Lorenzo Campground? 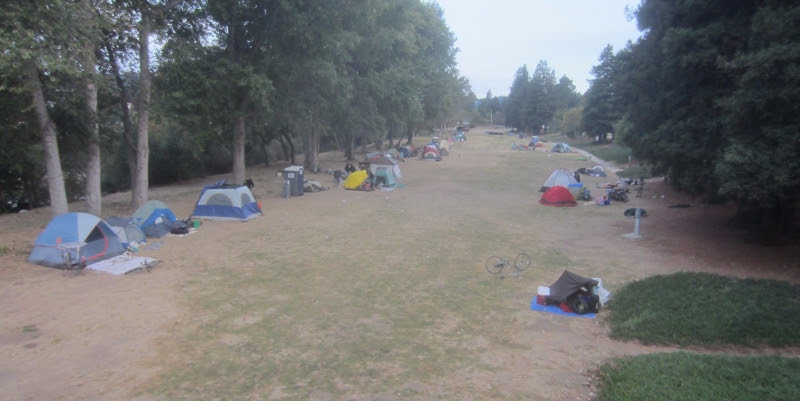 The Hooverville-type camp on the benchlands in San Lorenzo Park now faces eviction. 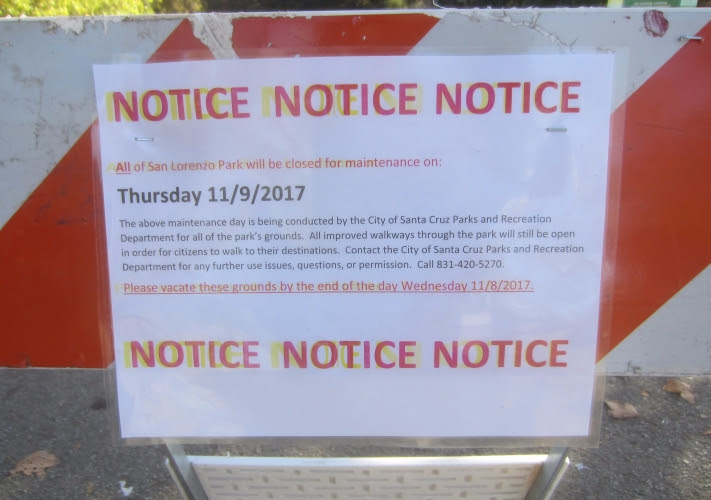 A notice was posted closing the park for “maintenance” on Thursday 9 November 2017. Now the City Parks Department says it is time to move along. Gorillas in the Mist: Are the Goonsquads Coming? The danger that this is an eviction and not a one-day relocation for “park maintenance” is real. It’s not really clear what kind of “maintenance” is required here. I’ve never heard of the park being closed totally to the public (other than the usual privatized-for-a-day financial scams) for this purpose. I suppose it could be a genuine “clean up” operation since San Lorenzo hasn’t seen so massive a continuous occupation since the Occupy movement of Fall 2011. However there’s been no reassurance (whatever weight that would really have) from Police Chief Andy Mills and Parks Czar Mauro Garcia–much less from the City Council–that the “maintenance” will be followed by restoration of the campground tolerance (and portapotty/washing station/trash pickup support). So this could be a dress rehersal for an evict-and-deport operation timed to operate with the opening of (as usual very limited) Winter Shelter program on November 15th. This also comes at a time when Berkeley’s successful “Sanctuary Village” style encampment “Here…There” (earlier known as First they Came for the Homeless) was driven off last Saturday by BART goon squads after a peaceful period of ten months there with community support. On the upside, note the unusual order by the federal judge Alsop. 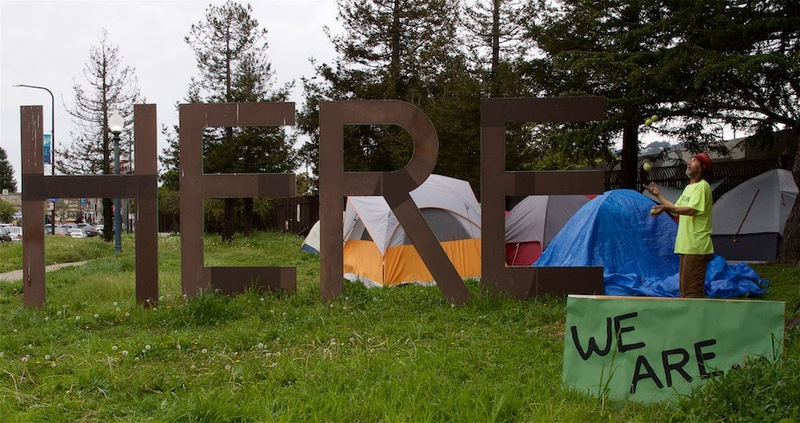 This is a rare call for information from an otherwise-hostile Federal judge (he denied the campers attempt to stop the BART demolition of the camp). ORGANIZING RESPONSE THERE BUT NOT HERE? City authorities finally realized–as Portland authorities did with the Dignity Camp that became Dignity Village in 2002–that they weren’t going to destroy the integrity and determination of the camp. So for ten months, they stopped the police raids, even yielding under pressure to allow a nearby portapotty to be set up. Now displaced camp residents have already set up camp again at City Hall. See https://www.facebook.com/firsttheycameforthehomeless/ . The determination not to end the protest-and-survive camp has been renewed with community support. First they came for the homeless. 4,194 likes · 430 talking about this. Action campaign for human rights. CAN SANTA CRUZ RISE TO THE CHALLENGE? In Santa Cruz, the same support kept the Freedom Sleepers going for 2 years until City Manager Martin Bernal unilaterally declared new “laws” banning constitutional protest there after dark. Food Not Bombs, newly strengthened with volunteers, has brought food to the Freedom Sleeper encampment every Tuesday. Some activists there have discussed solidarity with the campers when the police come to remove the survival campers on (or before) November 9th. Weekend warriors can e-mail Mills at amills [at] cityofsantacruz.com and Garcia at mgarcia [at] cityofsantacruz.com. Not to mention citycouncil [at] cityofsantacruz.com . Of course, the more direct course is to go down to San Lorenzo Park and offer support and solidarity to the campers themselves. Or contact Food not Bombs at the Santa Cruz Food Not Bombs facebook page. You can also reach HUFF at 831-423-4833. This entry was posted in HOT ISSUES and tagged Homeless, Sleeping Ban, Tent Cities by huffsantacruz. Bookmark the permalink.